A new and possibly real render of the Samsung Galaxy SIV(4) just broke cover courtesy of the guys at EvLeaks, who have been more than reliable in the past. In contrast to the other members of the Galaxy S Series, the Galaxy SIV does not feature a home button or the usual capacitive keys. The Galaxy SIV would feature full HD Super AMOLED Display, 13 MP Camera, 2GB RAM and an option of either 16GB, 32GB or 64GB storage memory. 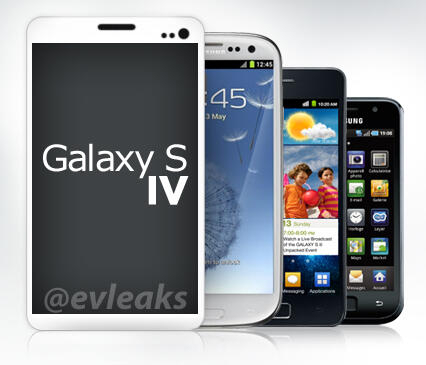 Considering that the Samsung Galaxy IV event is only 9 days away, I wouldn't be in a haste to dismiss these renders.